How to Convert PDF to Doc Format? PDF file format is considered to be a universal standard when it comes to online sharing of documents, contracts and confidentiality agreements, etc. At times there is a need to edit and convert these files to other formats and Classic’s PDF to Doc Converter is just the right tool you need. Download the Classic PDF Editor and save the setup file on your computer. Click on the image below to start the downloading process now. Install the software by double-clicking the Classic PDF Editor Setup file. 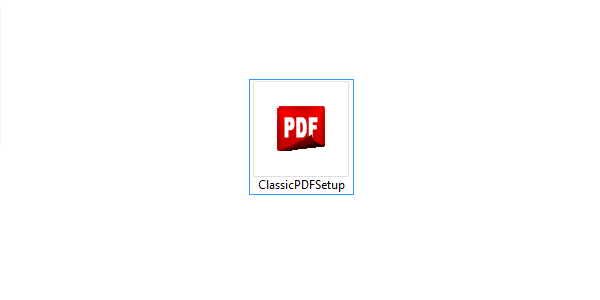 Double click the software icon to launch the Classic’s PDF to Doc application once the installation process has been completed. Open a PDF file in Classic’s PDF to Word Converter. Click Open on the main application menu and then select Open a PDF Document. Select the desired PDF file you want to convert and click open. Once you have selected the PDF file you want to convert, you will see the file open in Classic’s PDF to Doc Work Area. Select the Convert Tab from the main menu on top of the window pane. Select the PDF to Doc icon in the Export section and wait for the conversion to complete. Once the conversion process has completed, your processed file will automatically open in the Microsoft Word or any other editor you are using. Now you can name the Word file and save in the desired location. And there you go! Converting a PDF file to DOC was never this easy! Still, have any trouble converting your PDF files to Word document, watch the video below to get interactive instructions on converting PDF to Doc format. What makes Classic’s PDF to Doc Converter Reliable? You can now enjoy faster results, precise accuracy and improved consistency in layout, content, text, fonts, and colors when converting PDF to Word. Using the new OneDrive for Business –Connectors, you can save your processed Word files directly to OneDrive and later access them from a web browser or mobile device. It also allows you to create and share file access links with your colleagues. Classic PDF Editor is awarded for its ribbon-based design, providing an MS Office look and feel. This also ensures a shorter learning curve even for the first-time users. You can easily create, manage, edit, view, and modify PDF documents using the PDF to Doc Converter. Classic PDF Editor allows you to convert Word to PDF online while retaining the exact text, formatting, font, and images from the original file. Absolutely FREE to use, our Word to PDF Converter Online, offers no limits to file size and no ad watermarks. Upload the Word file you want to convert. You can either directly upload the file available on your device or choose to attach it from your Dropbox account. You can also punch in the URL of a Word file available online that you would like to convert to PDF. Add the e-mail ID you would want the converted PDF file to be sent at. Hit the Convert Now button and wait for conversion. Your processed file will be soon dispatched on your provided e-mail ID. What makes our Online Word to PDF Converter the best? Classic PDF Editor’s simplified user interface allows anyone to convert Word files to PDF format smoothly and without any hiccups. Using our Word to PDF Converter Online, you can convert multiple Word files to professional PDFs without any ad-watermarks and limits. SSL encryption allows us to keep your email addresses and files completely safe and secure from any third-party access. Classic PDF Editor is fully compatible with all major platforms, web browsers and devices, allowing users to access the website from any device. Our PDF to Word Converter is accessible without any location boundaries. All you need is an Internet connection to process your word files to professional PDFs. Now you can equip your employees with a high-quality PDF to Doc Converter and Word to PDF online application, and increase business productivity while reducing paper waste, improving data security, and minimizing printing. “I am a research fellow at the University of San Diego. I need to compose research papers frequently. During the preparation of my documents online, I often have to come across the PDF files containing valuable information that needs conversion to Word for editing and reviewing purposes. So, I started looking for a full-featured PDF software that was capable of both converting and editing documents. After an extensive search, I came across the Classic PDF editor (a single and affordable program) which provided the ultimate solution to all my documentation problems. I have never composed my documents with such ease before. Hats off to the engineers!” –Ashley Clark, San Diego USA.